"An old café, an even older legend and a new threat. When Isabelle's secret past returns to haunt her nightmares, she must take action to protect her family from a threat that is closer than she realises. 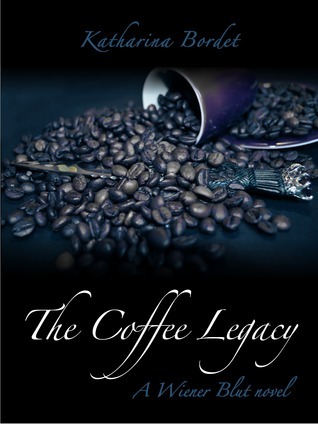 As she tells her sons the legends behind coffee and Vienna, it becomes clear that one such legend is still in the making, with her own family caught right in the middle." I did not expect anything to happen at all in this book. Especially the ending! Holy cow. There were certainly many twists and turns and it was all fun. I certainly loved the mix of fantasy/fairy-tale/legends and contemporary. It worked so much better then I expected. Honestly, I loved the beginning of each chapter; I thought it was super duper clever to have chapter titled with a fancy coffee with how to make it and the origin of each one. Not only it make dying for a cup a coffee and a donut to go with it, but it seemed to oddly add to the story. There is a secret world that sends people to come to our world and spread new ways how to make coffee. It seemed silly at first, but there is so much more to that world and to the story. The beginning was a little slow, but it got better as secrets and the "fairy-tale world" was a real world and all the secrets the characters were hiding would come back and haunt them. So good. The ending tho...I have mixed feelings. It was super duper sad, but I liked it. It certainly did shock me, but yes...I liked it. Ugh...Dominick. >____> *grumbles* Weak...pathetic...cry-baby...*grumbles* He DOES kinda sorta make it better, but still. I was sort of mad that Isabelle took him back soooo easily...yes, he did deserve to be forgiven because she wasn't innocent either, but honestly, he needed to earn it more. His secrets were "worse" in sense then hers. Yes, both lied and kept secrets, but honestly, I can totally see WHY she did hid it...his secret was dumb and if he had been honest sooooo many things could have been avoided. Bleurgh. ANYWAYS, I really liked this book. It was a fun adventure and I loved the story. It was a mix of contemporary and fairy-tale. It was done lovely and all the secrets slowly came out at the right time and it made me want to keep going. I did not like Dominick, but his secrets were important and made the drama. Poor Isabelle. The ending was sad, but I oddly liked it. I sometimes can't help liking sad endings. 0.0 In the end, this was really good. I shall stamp this with 5 stars. It is more like 4.5, but I rounded. I was surprised by how much I liked it. At first, I thought it was going to a "meh". Fantasy, coffee and Vienna - sounds delicious! I have to read this one!